President Donald Trump claimed during his second State of the Union address that unemployment for disabled Americans had reached an all-time low. The annual unemployment rate for disabled people was 8 percent in 2018, the lowest rate since the Bureau of Labor Statistics (BLS) started keeping track about a decade ago. Trump made the claim while touting the state of the U.S. economy. “Unemployment for Americans with disabilities has also reached an all-time low,” he said Feb. 5 after citing low unemployment for black, Hispanic and Asian Americans. BLS began tracking the unemployment rate for disabled people in the middle of 2008, using a monthly survey from the Census Bureau. The survey asks, among other questions, whether household members are deaf, blind, mentally impaired or have trouble with mobility. Unlike most employment data, the monthly unemployment rate for disabled people is not seasonally adjusted, making month-to-month comparisons difficult. The agency recommended two approaches: analyze unemployment using an annual average, or compare a given month across different years. When viewed the latter way, the unemployment rate for disabled people is not quite at a record low. The unadjusted rate for January, 9 percent, was slightly higher than the January 2018 rate of 8.8 percent. Trump’s claim is substantiated, however, when comparing annual rates. The first annual unemployment rate reported by BLS was 14.5 percent in 2009. In 2018, the annual rate for disabled people fell to 8 percent, the lowest on record. 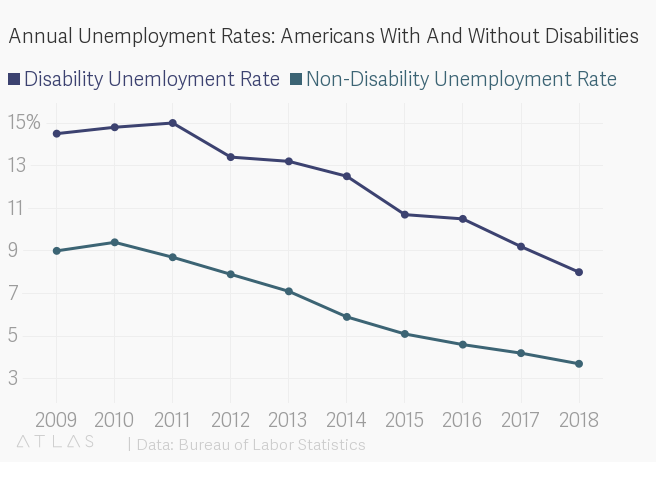 The unemployment rate for non-disabled people is significantly lower – 3.7 percent in 2018, down from 9 percent in 2009. Most disabled people in the U.S. – eight in 10 – were not in the workforce in 2017, compared to three in 10 non-disabled people. The vast majority were not seeking jobs and were therefore not considered unemployed. This, in part, has to do with the high number of disabled people over the age of 65, since they are more likely to be retired.